No worries, David Hazen Group offers Roof Cleaning that will remove the black algae streaks that will prematurely age your roof. WHAT CAUSES THE BLACK STREAKS? The black streaking typically found on homes in areas where moisture settles on shingles is not really caused by dirt, mold, mildew, or fungus; it’s primarily roof algae. Mold, mildew, and fungus are terms that most homeowners have come to associate with the discoloration of the roof and so they have now become a much-abused description of what is actually occurring on the roof. Scientists at 3M have identified the most common form of roof algae as Gloeocapsa Magma. These algae spores are carried by the wind, which is why so many houses in the same neighborhood end up with this problem. GREEN MOSS: If you notice, green moss growing on your roof then most likely your roof has already has been damaged. Green Moss a very strong plant that as it grows it will push hard against your roof granules causing your roof granule to dislodge. Green moss grows best where there is food to feed it. Basically it thrives in wooded lots off of decomposing tree leaves and seedlings. It’s always best to use a gentler approach. The safest approach is to use a product called Spray & Forget. Alternatively, you can use a 6-1 bleach to water mix. With our instant cleaning we spray on a chemical treatment onto your roof allowing it to sit for 10 minutes. After the 10 minutes, we use a light pressure rinse to wash off the black streaks. The benefits to this treatment, is that you will have instant results that you can enjoy right away. The disadvantages are that is more time consuming and does require a low pressure washer to clean the roof surface which will cause minimal granular loss, we feel that this is an acceptable risk because the Algae & Moss Growing on your roof is also causing granule loss. Is a liquid based detergent that is applied to the affected areas of your roof? Spray & forget is considered a gentler appreciate to roof cleaning because there is no low pressure rinsing needed. It works in time with Mother Nature. Spray & forget can take up to three treatments depending on the severity of the steaks. It works by applying the chemical generously to the affected area. Once applied the chemical coats your roof with soap like chemical that literally chokes the plant by preventing the oxygen from reaching the plant. As it rains the soapy detergents will gently was away the steaks within 2-3 months you wills start seeing the streaks disappearing. 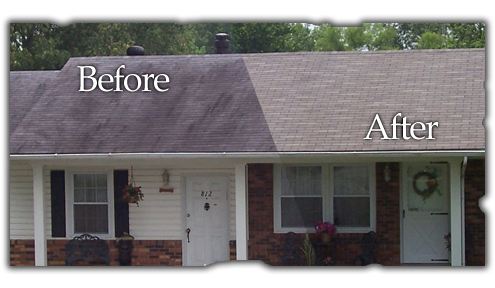 We recommend Spray & Forget if you have a older roof, if you do not mind waiting for results. As we said it normally takes 1-3 treatments with 2 being the norm and approximately 3-6 months to see the full results. Let the David Hazen Group revitalizes your roof today by getting your Free Roof Cleaning Quote.